Pregnant Blake Lively easily stole the show after she showcased her burgeoning bump in a flattering dress at the premiere of Cafe Society in New York last night. The blonde beauty looked in sparkling form as she glided down the red carpet while she got ready to take in her latest silver screen extravaganza. 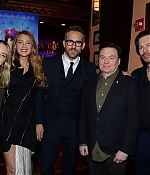 The 28-year-old, who it emerged in April is pregnant with her second child with husband Ryan Reynolds, seemed thrilled to be at the showpiece occasion in the Big Apple. Blake had certainly dressed to impress in her plunging whiute gown, which was adorned with fashion forward pink floral pompoms. It also boasted an adventurously high hemline, which, coupled with her towering stilettos showed off her model-quality legs to the full. 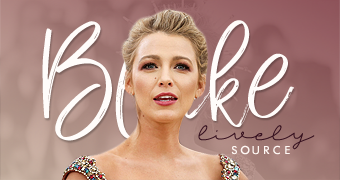 Sorry for the lack of updates over the past few weeks, terrible timing… I have finally added x118 photos of Blake at the The Age of Adaline Premiere in NYC on April 19th 2015. Blake Lively and Ryan Reynolds looked ever the Hollywood duo arrived to the Cannes premiere of The Captive wearing matching black and white ensembles. 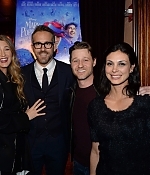 37-year-old Ryan Reynolds married the blonde beauty in September 2012 and the star could not take his eyes off the Gossip Girl alum, 26, as she posed for snaps on the red carpet. And it was easy to understand why he’d be so taken with the actress, as she was positively gorgeous in a long flowy Gucci bespoke monochrome gown. The strapless frock displayed her alabaster complexion, as she pinned her hair in a glamorous part with a swept to the side bun. Ryan was equally fetching in a dapper black and white tuxedo, which featured a white bow tie adding a touch of flair to the refined ensemble. Directed and co-written by Atom Egoyan, The Captive is a Canadian abduction thriller in which Reynolds plays Matthew, a landscape gardener whose daughter Cassandra was kidnapped while walking through a car-park eight years previously. The Captive will hit theatres June 10. Blake Lively wows in sequined waist-cincher dress as she leads the fash-pack at Mr Turner premiere in Cannes. She always looks red carpet ready and certainly stole the show at the 67th annual Cannes Film Festival for the second day running. The gorgeous girl headed out to the premiere of new Mike Leigh film, Mr Turner on Thursday evening, a beautifully shot biopic about the famous British painter, played by Timothy Spall. The 26-year-old looked incredible in a white sequined Chanel dress which cinched her in at the waist and showed off her slim figure. With a plunging neckline and a fishtail hem, the dazzling number was sure to make her stand out from the crowd. Accessorising with a chiffon scarf draped over her arms, Blake, who is the ambassador for L’Oreal Paris, polished off her look with jewellery by Lorraine Schwartz. She wore over a million dollars worth of diamonds including a pair of 30 carat diamond flower earrings. Giving herself some extra inches, the stunning star wowed in a pair of pearlescent Sophia Webster court shoes. Blake Lively is currently in Cannes as the ambassador for L’Oréal Paris. And showing exactly why she was picked for the job Blake Lively made sure she looked sensational as she walked the red carpet as Nicole Kidman’s film Grace Of Monaco opened the 67th Cannes Film Festival on Wednesday evening. The 26-year-old looked a million dollars in a burgundy Gucci gown which featured a thigh high split, revealing her slender legs as she strutted down the red carpet. 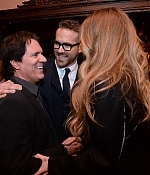 Blake Lively supported her hubby at the NYC premiere of his new film “Turbo” yesterday. Blake never fails to steal the spotlight on the red carpet. Her gorgeous figure, face, and style can light up even the most star-studded room, and this was no different! She was decked out in a dazzling skirt and looked drop dead gorgeous. Both Ryan & Blake wore Burberry for the glam occasion. Blake wore a thin grey tank top tucked into the most glamorous skirt we have ever seen from the Burberry Prorsum Resort 2014 collection. The front of the skirt was covered in all different embellishments – jewels, sequins, gems – and was skin tight. The pencil skirt ended a little below her knees. Christian Louboutin ‘So Kate’ pumps completed her ensemble.